Steam Tower is one of Net Entertainment’s most popular slot games around today, and it’s gained a fairly large reputation for being a low, and medium, and high variance game… which obviously isn’t the case, but some players just “can’t win” on it… while others “do alright”… and others physically “can’t lose”! It’s funny to see player reactions, and with such a temperamental bonus-round, many players find themselves either die-hard Steam Tower fans, or athletic runners, sprinting away from the game as fast as possible. Regardless of how you feel about it, there’s no doubt that Steam Tower is a well-made game, and in terms of other Net Entertainment Video Slots, there’s nothing really that can compare to it. The basic theme follows the life of an industrial worker, trying to working his way to the top of the Steam Tower, and the game uses 5 reels, three rows, and 15 pay lines to deliver an optimal gaming experience. There’s both an AutoPlay function available, and a Quick Spin mode, which allows you to 1) set a number of games, so you don’t have to click each and every time, and 2) so that you don’t have to wait so long for the reels to spin. Symbols on the reels themselves include low-paying playing card symbols, which includes 10, J, Q, K, and A, and the high-paying symbols include a Red Dragon, a Lady, embroiled in a yellow circle, and a man in an Orange bubble. 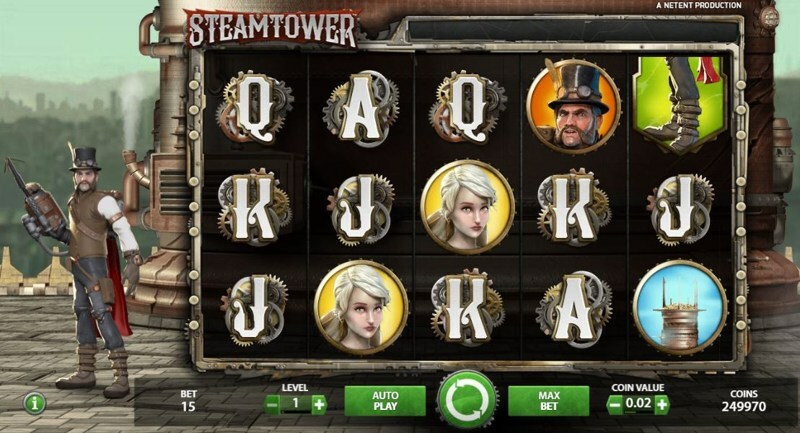 The Wild Symbols are vibrant green arrows, and the scatter symbols is a giant, reel-sized Steam Tower – the man himself! Now, if you’re a player who likes to enjoy gaming from a computer or laptop, then fine; no problem! However, if you’re a mobile user, and prefer to game from a mobile phone or tablet, you may think a high-quality game like Steam Tower is out of the question, in terms of running on your mobile device – but you couldn’t be further from the truth. Net Entertainment have developed Steam Tower to run flawlessly on mobile devices, and so long as you have a steady Internet connection (4G or WIFI is always preferable), you’ll be able to enjoy a hassle-free, interruption-free gaming experience right away. If you manage to land an entire scatter symbol in view (I.e. 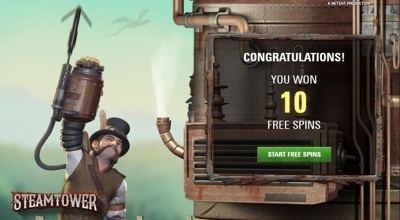 the whole Steam Tower man), you’ll enter the bonus round, where you are initially awarded with ten free-spins. You start on level one, and on a 1X multiplier, and each time a wild symbol lands on the reels, you’re awarded two extra free-spins, as well as moving up one level, and one multiplier level. There are 16 levels in total, and the multiplier goes up to 7X, and if you manage to reach the top (level 16), you’ll instantly win a 1,000-coin prize (assuming a bet-level-1 stake), alongside the 7X multiplier. This gives you a phenomenal chance of hitting big, and playing-card 4-of-a-kind pay lines can amass to huge payouts. While you can’t re-trigger the feature (aside from landing extra free-spins through the wilds), Steam Tower is known for dropping the feature relatively regularly, and many players claim that the feature tends to drop in “batches”, i.e. if you have it once, you’re likely to get it again soon.